Self Guided Audio Lessons – New Releases! Self Guided Meditation & Feldenkrais® Audio Lessons – New Releases! Imagine you landed on a deserted island and need a comprehensive self-help kit to keep your body healthy and tuned up. These six collections of audio guided lessons in a NEW, 2nd Edition with Tracks to break-down the lesson in smaller chunks to address the most common areas needed for Optimal Vitality, Performance and Healing. Over 39 newly mastered individual lessons are available – each series below has more information– click the links below. Move with refined agility and core strength. Balance is the key to health. These lessons will develop beautiful posture and overall graceful movement. Excellent for anyone working on core power, balance, posture, mental and emotional neutrality and stability. Useful to improve ease and agility for walking, running, swimming, hiking, biking, dancing, yoga — any sport or hobby. 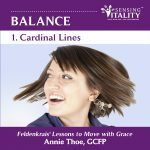 Here’s a link guiding you to all 6 Balance lessons with benefits, descriptions, listening links of each lesson and how to use this series. Click here for more lessons on CDbaby or purchase on iTunes- search for “Annie Thoe” – for iPad users go to Amazon. Connection to your breath is the ultimate power of presence and vitality. Feel more alive and connected with life. Improving your breathing helps open your chest and strengthen the entire body to receive more oxygen. Excellent for anyone seeking more energy, well-being, move with ease, deeper sleep and rest, release tension and pain, and unwind mental stress. Helpful for maintaining presence and concentration in all activities. 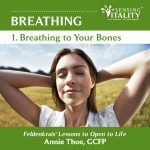 Here’s a link guiding you to all 6 Breathing lessons with benefits, descriptions, listening links of each lesson and how to use this series. Click here for more lessons on cdbaby or purchase iTunes- search for “Annie Thoe” – for iPad users go to Amazon. Move your head, neck and shoulders in a lighter, easier and uplifting way. Is your head heavy or always hunched forward? Is your neck stiff? Release chronic tension, emotional stress and find easier support for the “executive” functions of the body. Find your horizon and get your head in a much better place for all activities and lighter state of mind. Develop internal support and alignment for sitting upright at your desk, computer or car. Improve ease of your shoulders, low back and pelvis. 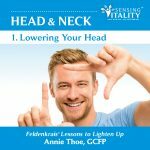 Here’s a link to my webpage with details on all 6 Head & Neck lessons with benefits, descriptions, listening links of each lesson and how to use this series. 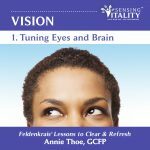 Click here for more lessons on cdbaby or purchase iTunes- search for “Annie Thoe” – for iPad users go to Amazon. Improve how you use the “work horses” of your back, hips and legs to move easier with your entire body. Utilize your bones to support your weight while you move. Excellent for getting your back and pelvis in a better, stronger place for all activities. Feel the power of your core working for you. Release chronic tension patterns and experience confidence in moving again. Also helpful for ease of neck, chest and shoulders. 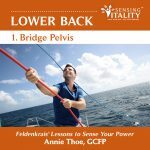 Here’s a link to my webpage with details on benefits and descriptions of each of the 7 Lower Back Lessons (Bridge Pelvis, Head & Pelvis Clock,Lengthen & Lift Back, Releasing Hips with Feet, Hello to Hip Joints, On Belly with Legs Pushing, Buttocks Walking) Click here for cdbaby or to purchase on iTunes- search for “Annie Thoe” – or Amazon. Unleash your creative potential with more freedom in your chest, arms and hands. Improve how your arms move with your chest and entire body for ease and reduced tension. Connect with your heart. Excellent for self-expression, ease in breathing and working with your hands. Helpful for chronic injuries with hands, shoulders and neck. Expand creativity for artists, writers, musicians, actors, dancers and all trades. Also improve ease with low back and hips. Her’s a link to my webpage with details on benefits and descriptions of each of the 6 Shoulder lessons (Feathertip Control, Wring & Roll, Pull Arms/Free Shoulders, Lift Off with Your Wings, Moving Wings Behind, Lengthen Arms.) Click here to access on cdbaby or to purchase on iTunes- search for “Annie Thoe” – or Amazon. This powerful collection improves the entire brain function for greater perception, clarity, deep relaxation and lightness in your life. Access the executive function of your brain for: problem-solving, deeper sleep, smoother movement, reducing pain and emotional calm. Take a break in your day to refresh and clear your brain from clutter. Like the Breathing Collection, lessons improve performance and ease for the entire body for sports, hobbies and work. Here’s a link to my webpage with details on benefits and descriptions of each of the 6 Vision lessons. Click here to access on cdbaby or to purchase on iTunes- search for “Annie Thoe” – or Amazon.